Because of its beauty that makes time stop for an instant, the expression l'heure bleue has come to describe a variety of special times and events, not just a description of a special blue glow at dusk. 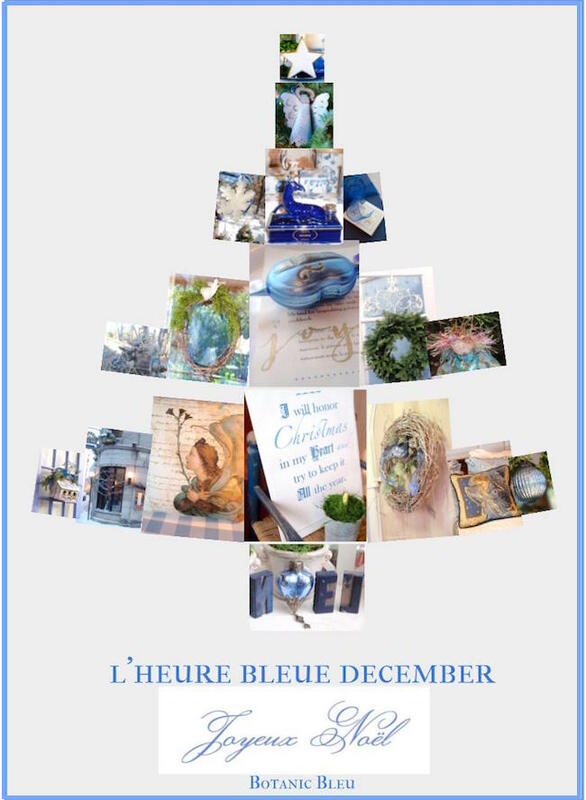 Each month in 2016, I shared a collage of blue images that create a little l'heure bleue for me. The December Blue Hour collage is the last of the series. I hope you have enjoyed seeing them as much as I enjoyed creating them. P.S. You did not miss the November Blue Hour. Sometimes life happens, and at this stage in life, I've learned to move on. So much could be said about each photo in the Christmas tree collage. You know that I am never at a loss for words or a story... told along the same way as Rose in Golden Girls. Just one photo, the tree trunk, gets its stories told today. You can pick out your favorite photo in the collage and create your own story to go with it... or remember a story I've told about it before. If you want, you can share your story in the comments section. Notice the letters N and L look backwards? The letters are vintage wooden typesetter letters from the largest flea market in Paris, France. Some say the largest flea market in the world. How could I leave the blue ink-stained letters behind once I saw them? 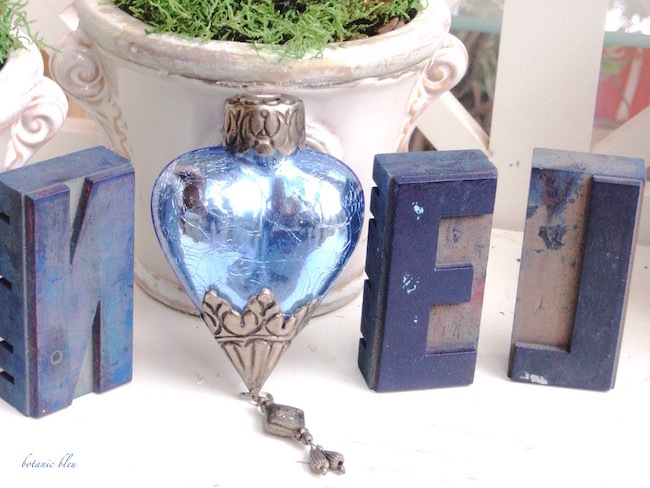 The blue mercury glass heart was a gift from sweet blogging friend, Laura of Decor to Adore, when she came to my French Country Christmas Event to shop. Now, who else do you know brings a present for the person holding a sale? Yes, dear sweet blogging friend, Laura, who welcomes Texas bloggers into her home for cookie exchanges, comes bearing a gift. I just knew I didn't need to buy an O letter. Thank you for reading Botanic Bleu. Blogging has opened the door to so many new friendships, most of which are virtual friendships nurtured online via comments and emails. I know there were more at our irregular gatherings. Please list your name and blog in the comments below if I left your name off the list. I will think of more names at two in the morning, I'm sure. is a new series coming in 2017.
live each Sunday at 4:00 p.m. Exquisite blue beauty! The heart ornament is gorgeous and unusual. Wishing you the happiest of New Years! You are welcome. I am happy to know that you have found ideas to use in your own home. A very happy new year to you. 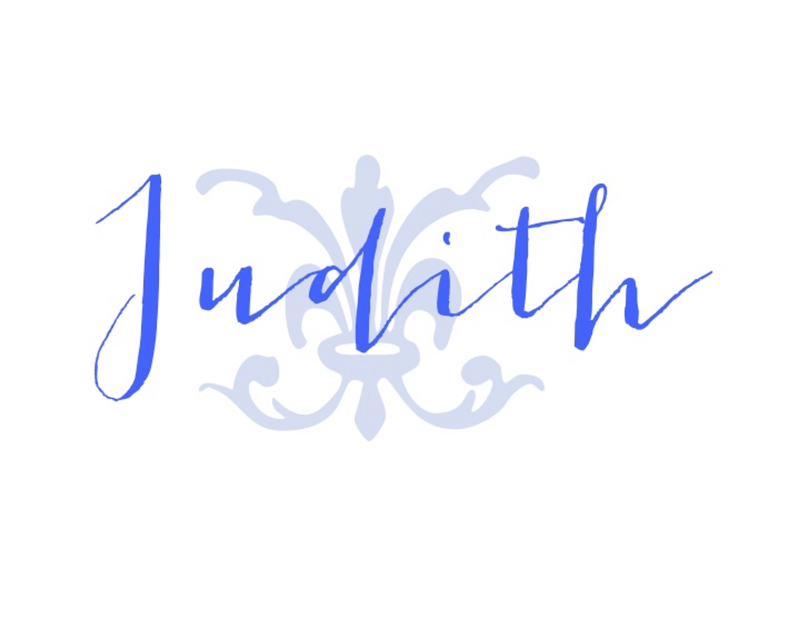 Judith, this was a great series! Love the photo "tree"! I also love the typesetting letters. I have N O E L as well as several A's. I used to have J O Y but those got lost in a move - probably wrapped in a ton of paper that I didn't unwrap! I have actually used the letters with a stamp pad to make them not reversed on paper. As always a lovely post with many ideas! The photos tree is super cool! Happy New Year! 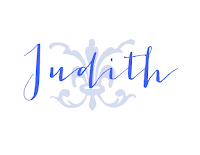 Judith, thank you for listing our TaDa party on your site. What a beautiful gift of the blue heart ornament. How wonderful that you have gotten to be friends for real with bloggers in your state. I hope someday to meet some of the lovely people I have gotten to know through blogging too. Beautiful blues!! Thanks so much for taking the time to visit! !